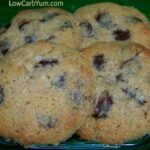 If you prefer soft buttery keto cookies, these gluten free low carb chocolate chip cookies are sure to satisfy. They tastes very close to the real thing. 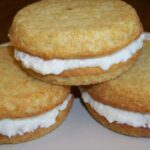 I finally found a recipe for keto cookies that is almost as good as the original high carb Toll House recipe. This one even passed the picky 13 year old daughter test. It also got past my daughter’s friend who had a few and said they were good cookies. I plan to make a big batch of this dough later and freeze it to bake on my busier days. 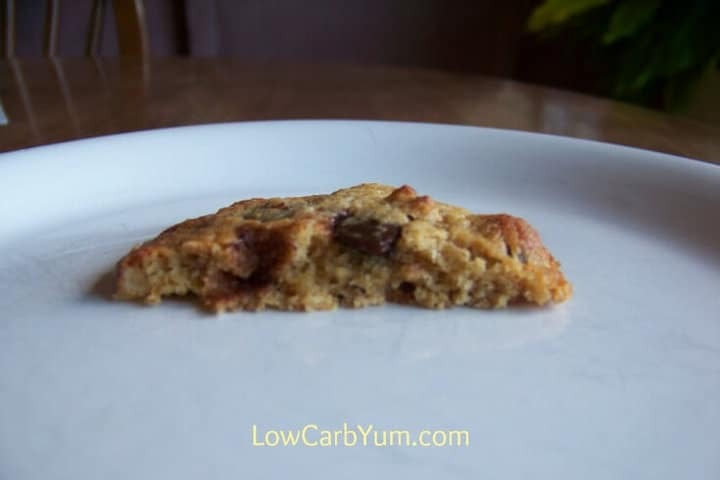 I liked these low carb chocolate chip cookies so much, I will bake some for the holidays. 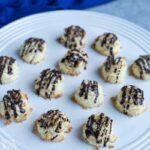 These keto cookies are also soft and chewy, just like the popular high sugar ones. You can cook them a little longer if you like crisp cookies. They have a nice buttery flavor and the nut flours are not overpowering because of the added vanilla whey protein. These are also true cookies, nothing like cake in texture. 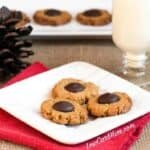 The blackstrap molasses adds the touch of brown sugar which is needed to make these low carb chocolate chip cookies just like traditional ones. I was tempted to add polydextrose, but the thought of the intestinal distress it causes led me to leave it out. It was a good decision because the cookies don’t need it. It was probably the molasses, but it could also have been the addition of peanut flour that gave the cookies their nice texture. I wasn’t sure if the cookies would flatten out on their own so I did flatten the dough balls a little before baking. But, this turned out to be unnecessary. There is enough butter in the dough that the cookies melt down on their own. Using a cookie dough scoop makes the shape of the cookies uniform so I highly recommend using one. If you are going to freeze the dough to use later, I recommend forming the dough into mounds with the scoop on a cookie tray and placing the tray in the freezer. 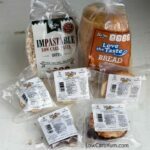 Once the mounds are frozen, put them in an air tight container or freezer bag. 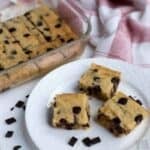 You’ll want to make a large batch of these low carb chocolate chip cookies as the dough freezes well and can be frozen in scoops. This helps with portion control as you can bake only a few at a time. You can even just bake up a few in the toaster oven. If you have a peanut allergy or just choose to avoid it, you can substitute it with coconut flour, more whey protein, or more almond flour. The recipe is quite flexible. I used a mix of flours and whey protein because I find it gives the best results. I should warn you that the cookie dough itself is pretty good. So you may need to have some self control if you are making a large batch. If I kept a container in the refrigerator, they likely wouldn’t ever get baked into yummy keto cookies. It’s pretty amazing the difference a small amount of blackstrap molasses makes. And, it’s such a small amount, there’s very little carbohydrates added. If you’re concerned about adding in real sugar, you could try a low carb substitute. I’d recommend either Sukrin Gold syrup or Sukrin Gold granular. If you want a crisper cookie, you may want to check out my walnut chocolate chip cookie recipe here. 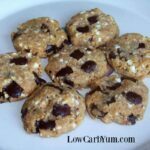 If you prefer a soft buttery chocolate chip cookie, these low carb gluten free chocolate chip cookies are sure to satisfy. They tastes very close to the real thing! Preheat oven to 375°F. Line baking sheets with parchment paper or use a non-stick baking mat. Beat together butter, erythritol, stevia glycerite, and molasses until light and fluffy. Add egg and beat well. In a separate bowl, stir together almond flour, vanilla whey protein powder, peanut flour, baking soda and salt. Stir almond flour mixture into butter mixture until blended. Stir in chocolate chips and chopped nuts. Use cookie scoop to measure and drop onto prepared baking sheets about 2 inches apart. Bake for 8-12 minutes, or until golden. Allow to cool for a couple minutes on baking sheet then remove to wire racks to cool. It's best to use whey protein powder. However, the protein powder could be replaced with almond flour or a mix of almond and coconut flour. Dr Berg uses a little black strap molasses in his cookies. He says the small amount does not make enough difference. So your cookies are KETO. I have not tried yet but I am going to tonight. Blackstrap is the healthiest molasses as it’s where all the nutrients end up when sugar is refined. It was my go to ingredient for low carb brown sugar taste before sweetener companies started making keto friendly versions. Delicious! Used chocolate whey, will omit salt next time. 4 star rating! Thanks for letting us know how the cookies turned out! Thanks for the recipe. I used 1/4 swerve and 1/4 c brown sugar swerve that I found in the store today! I also only had chocolate whey protein and used it for double chocolate chip cookies. I confess I also doubled the chips and put 1/2 tsp vanilla. Didnt seem right not putting in vanilla. They turned out fabulous! Thanks for sharing. The chocolate whey sounds like a nice way to make a chocolate cookie! I have been keto 3 years now and this is by far the best cookie I have tried. Can a double chocolate version be made? I Would like to make a double chocolate version can you give me some suggestions on how much cocoa to add and still get the same texture…..
they taste the best once cooled. You could try backing off the flour and add 3-4 tablespoons of cocoa. Was hoping you could post the low carb brand you use for whey protein. Thank you! I like to use Isopure because it’s zero carb. I made these over the weekend and they were awesome! I did have to change the temp to 325 for about 8 minutes worked perfect. Thanks for sharing the temperature change. Ovens can vary and mine is a convection, but I adjust to regular baking temp. I baked these cookies at 375, I checked them at 6 min and they were burned. These ingredients are expensive so needless to say I was disappointed. They should not have burned that quickly. Were they on the middle rack? I can add a note to check sooner. While the texture of these cookies was good, my family didn’t care for them. What can be substituted for the Peanut Flour or the PFlour alternative, Coconut Flour (family member is allergic), … more whey protein? Using more almond flour will make cookies heavier and dense, which I want to avoid. When they were baking, all we could smell was peanut butter, and even the finished cookie had a muted flavor. If I wanted to make peanut butter cookies, I would have. I wanted choc chip cookies, but this is the 8th choc chip cookie recipe I’ve tried that disappointed us again; still haven’t found a CCC recipe that “screams” chocolate chip cookie! I used an Oxo Med. cookie scoop to make cookies that were larger, 1.5 tablespoon, than the stated size of one tablespoon, and cooked them for 9.5-10 minutes. Although we baked them at 350°F instead of the stated 375°F, cookies were burning around the edges at 5 minutes like other reviewers mentioned. They became crispier with just one extra minute of baking. So, they have to be watched closely if you don’t like crispy cookies. More whey protein should be an acceptable sub for the peanut flour. Almond flour should work too. My cookies came out very cake like. What did I do wrong. Tried it twice, and the same results both times. Thru both batches away. I’d love for these to work. Just don’t know what I did wrong. Welcome any advice you might offer. These are soft baked cookies. 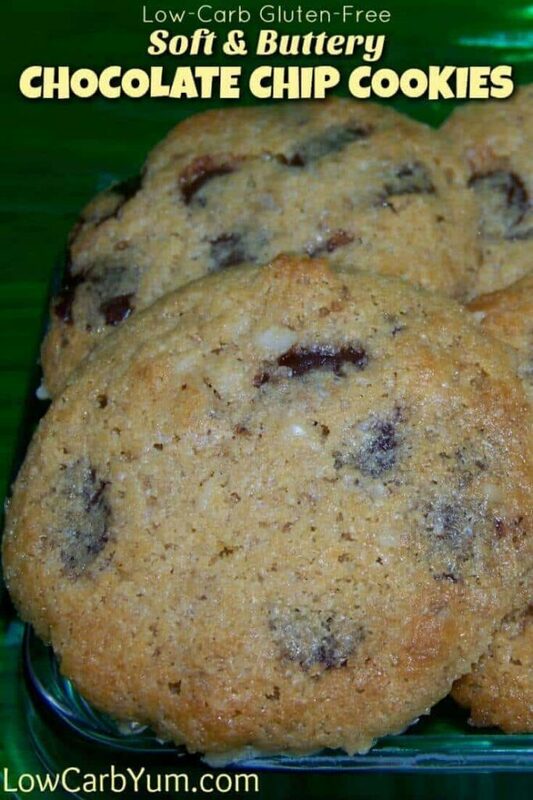 If you prefer crisper cookies, I suggest you try this flourless chocolate chip cookie recipe. These turned out great! Mine came out crisp and thin, and loved the flavor and the crispness. Best LC cookie I’ve ever made or eaten! Not keto, because molasses isn’t optional in keto, and whey protein powder is a No go because it’s not a keto ingredient. 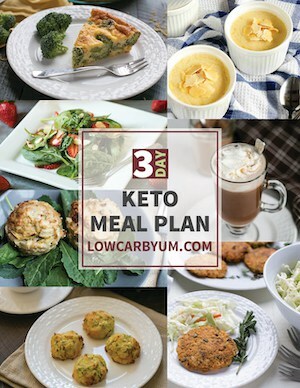 Keto is more than just low carb. No protein powder, no molasses. 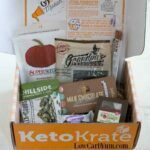 Low carb is not keto. 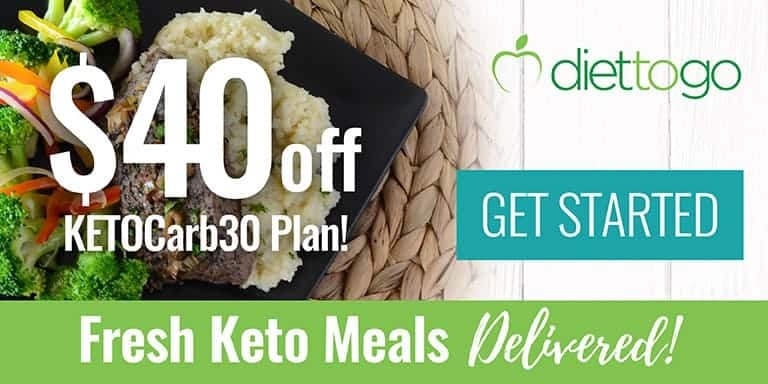 Protein powder is allowed on keto and the blackstrap molasses can be omitted because it’s an optional ingredient. This is a very old recipe that was created before I knew about Sukrin Gold (it may not have been available back then). 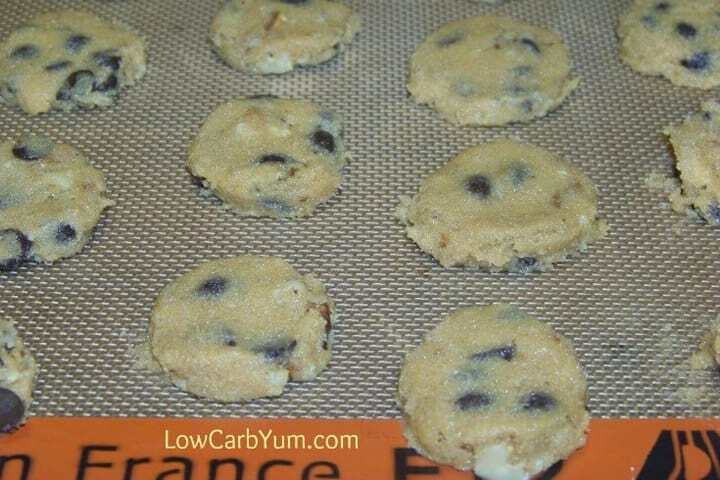 On another keto site belonging to a professional baker, it was said that cookies made with erythritol and some of the other sugar alcohols must cool completely, preferably overnight, to have the proper texture. I’ve experienced the same which is why I let cookies sit overnight in the refrigerator. 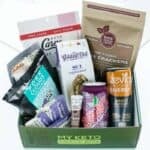 I would like omit the almond flour altogether because of allergies, can I only use coconut flour? If so, how much? Typically, you only need 1/4 to 1/3 coconut flour for every cup of almond flour. And, you’ll have to increase liquid and or eggs. Have these in the oven now. I only had regular whey, so I added vanilla kept “sugar” the same amounts. My sugar is Bochawsweet and liquid s tevia. I’m SO hoping they will be a good chocolate chip cookie. Excited for the results. thank you!!! Hope they worked out with what you had on hand. My kids love these cookies. Carb count of 1g ? I used swerve and xylilol and they both have 4 g of carbs per teaspoon. For low carb do I not count the carbs in natural sweetness? Still learning. The carbs in Swerve are from erythritol which can be subtracted. With xylitol, it’s best to count at least half of the carbs. Does the peanut powder make the cookie taste like peanut butter? So I tried this recipe today. I used more almond flour instead of the peanut powder. Honestly, its okay, but I really can’t stomach the taste of the protein powder in the cookie. I made this recipe lastnight without the molasses and protein powder and it was great (Andres Regalado’s recipe http://the-lowcarb-diet.com/low-carb-chocolate-chip-cookies/#comments) The molasses might make the recipe better so I’ll have to try this recipe without the protein powder and also try it with the peanut flour to see if it makes a difference. The whey protein makes for a lighter texture. You could try subbing out both the whey and peanut flour with coconut flour. I don’t have peanut or protein flour, but I do have almond and coconut flour. How much coconut or almond or both, should I use in the recipe? Try a 3:1 ratio of almond flour:coconut flour. You may also want to add additional sweetener. These are fantastic! I made them exactly as written and got about 2.5 dozen cookies using a Tblsp measuring spoon. Perfect size. I’m usually not too fond of low carb sweets just because they never taste anywhere near the real thing, but these were perfect! Thank you so much! I’m so glad you like them. I made these ones for the kids and they liked them almost as much as the real thing. These are, by far, the closest low carb cookie I have had to the real traditional deal that comes to mind when thinking, “I want a chocolate chip cookie”. I say this having tried -many- recipes looking for just that. I followed the recipe exactly and have no complaints. Thank you!!!! A keeper for sure. I especially love them right out of the freezer. Thanks so much Sara! 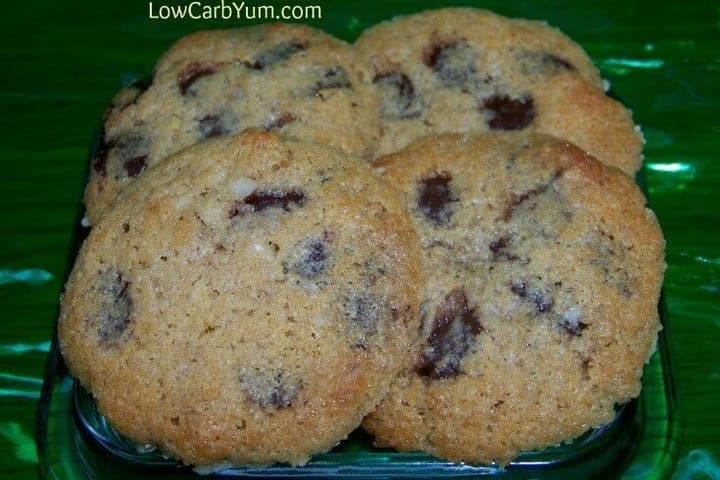 These are my low carb go to for soft and chewy style chocolate chip cookies. Do you think these would work with an egg substitute like flax seed/water. I’m having a sensitivity to eggs. I don’t see why not. I prefer using psyllium eggs, but flax should be fine. I made them 325 9mins with 3/4 cup swerve and no peanut flour. I used coconut flour. The best cookie ever! I only have flavorless whey protein powder. Could I add vanilla extract in addition to the powder or will that alter the consistency? That should work with added vanilla and a bit more sweeter (may want to add to taste). 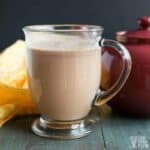 Can you make these without the whey powder? I am lactose intollerant. Thanks! I’d add in a little coconut flour in it’s place. You could even leave out the peanut flour if you used coconut flour. These look great but I cannot handle the SAs. May try with Monk fruit and 90% chocolate and see how they turn out. 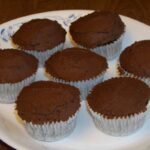 You should be able to use any alternate sweetener in these. These are delicious! Thank you so much for sharing this recipe. I have a sweet tooth and these will definitely help me stay on track. I did lower the temperature to 350, and they turned out great for me! Glad you enjoyed them! I’m in need of making this one again! I’ve adopted a sugar-free diet and would like to make these cookies without using the molasses. Do you have any recommendations? Should I increase the Swerve? Can’t wait to make these! The small amount of blackstrap molasses is added to give a brown sugar effect to the low carb sweeteners. You can leave it out if you wish. Thank you for answering, Lisa. I appreciate it. I was seriously thinking my stove was going bad last night. It’s pretty old. Anyway, I do use a different whey protein powder than you do. I’m going looking for the silicon mat today, too. If I don’t find it I’ll get one on Amazon and try again. Even with the toasty bottom of the cookies we’re eating them and I can still taste how yummy the top part of the cookies are. I think this will be a go-to recipe for me if I can get the problem figured out. Thanks so much for this and all of your recipes! I made these cookies tonight. I followed the instructions and double checked everything. Mine were burned on the bottom by 4 minutes of baking. I started to smell it and opened it up to look. I turned the oven off and left them in there as the top was still wet and I was hoping to salvage a few. The only thing that I can think that I did differently is that I used parchment where it looks like you used the mat. Could that be why they burned? I double checked everything and can’t figure out why they burned. I’ve been making some other low carb chocolate chip cookies every few days for the past couple of months and have never had this problem. Maybe my oven is broken? lol I really can’t figure what I did wrong. Please help? Thanks for the recipe. I think they’ll be wonderful if I can figure out where I went wrong. There are several things that could have gone wrong. The fat content in the peanut flour does make a difference. Also, it could be the brand of protein powder, I use Designer brand. Other things I can think of are the silicon mat and also the fact that I use a convection oven. These cookies came out really well for me and I do swear by the non-stick silicon mat which was well worth the cost. Convection ovens cook differently than standard electric or gas. Wish you had mentioned that earlier. thanks. I haven’t noticed much difference as I do adjust my convection oven to be comparable to a regular oven. However, I’ve notice that ovens can vary. Mine were actually quite overdone at 8 minutes too – still delish though. Whenever I get around to making the second batch, I will definitely take down the heat some and check them earlier! 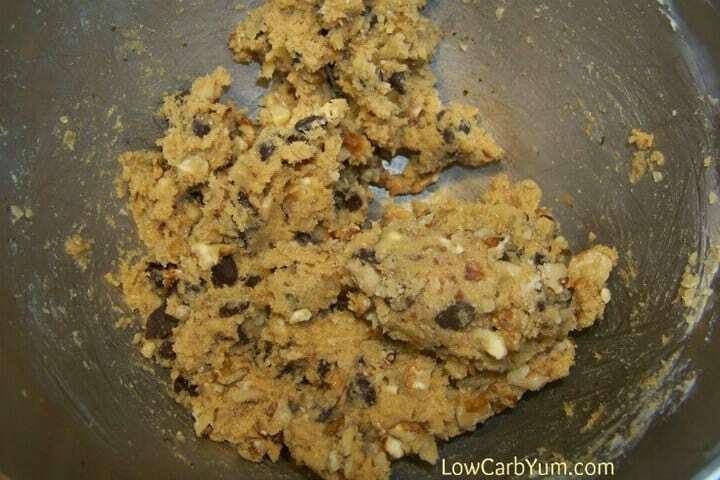 Btw, the cookie dough is amazing – thinking about making a batch without the egg so I can just eat the cookie dough! Might be differences in ovens. I do use a convection oven set at 25 degrees lower. Mine were overdone at 9 min, burnt on the bottom. I also used parchment paper and have a convectiono oven. Very soft too. Nice flavor but I would omit the salt if using salted butter. I will try with coconut flour next time. Almond flour should be fine as a substitute. The difference is that peanut flour is finely ground and defatted. I use the Protein Plus brand. It is available at Netrition, but I do a price check on the net to compare before buying. I don’t recall where I bought it last, but I think I found a better deal than Netrition last time. Hi Colleen. There’s never a silly question. Yes. The vanilla whey protein is the same powder used to make shakes. Just look for one that’s low in carbs. Sounds like yours should work. These look so delicious! I plan on trying them soon! Oh, these look good! They look like regular cc cookies. I have already bookmarked the recipe to try!